Taste of Italy: Discover the Romagna in Emilia-Romagna! Discover the Romagna in Emilia-Romagna! Although part of the same region, Emilia and Romagna are quite different, in many ways. The Romagnoli are also different from the Emiliani - that is something that is quite easy to notice once you work side by side with a Romagnolo/a. Their sunny disposition and ability to solve any problems with a smile is a virtue the rest of us envy. 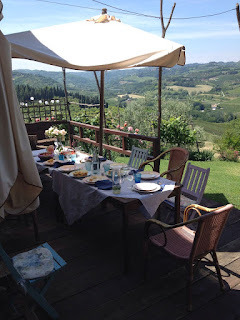 A couple of friends of mine have put together a week-long trip of food and culture in the Romagna area that is just wonderful. You'll get an in-depth view at things and food that are unique to the Romagna area. I participated in the trip they organized in May and was very pleased at their attention to details. All the locations are beautiful, all the guides, the cooks and chefs are very good at what they do and a lot of information is covered. Let's just say that even I learned a few things I did not know! Having tested first-hand this package I can absolutely recommend it. I hope to come meet you one of the days you are on the trip, please be sure to let me know if you book the trip! They are now taking reservations for their September and October dates. If you need 2019 dates please write to me with "Romagna trip" in the subject of your email. 8 days / 7 nights Tour for active, curious people. Your accommodation for the week is in a medieval village, where every morning you'll breakfast surrounded by the scents of the hotel's private garden, and hear the town church bells ring; it is a two minute walk from the lively center of Santarcangelo di Romagna, where you can stroll the narrow cobblestone streets and reach shops and city markets. In the nearby hills we will cook and eat together at a charming country villa. Here is an outline of the daily itinerary. · WELCOME TO ITALY Day One (Sunday): Arrival to the medieval town of Santarcangelo di Romagna. Introduction to the tour and the town, and dinner at one of the best restaurants in the region. · FOOD AND WINE IN THE ROMAGNA HILLS Day Two (Monday): After breakfast at the hotel we’ll meet at ‘our’ café in centro,our meeting place for the rest of the week. We’ll transfer to the country villa where we’ll have our first cooking lesson, preparing what the Italians call il pranzo della domenica, which of course we’ll then enjoy along with delicious local wines. Later in the afternoon we’ll visit a local winery with an expert sommelier followed by a wine tasting accompanied by typical appetizers (stuzzichini). Later we take a tasting tour of Emilia-Romagna with its superb and famous products including parmigiano cheese, specialty cold cuts, balsamic vinegar of Modena and the traditional Lambrusco and Pignoletto wines. · SAN LEO HISTORY, TRADITION AND BEL CANTO Day Three (Tuesday): This morning we step back in time with a visit to the medieval town and fortress of San Leo. In the afternoon we’ll visit a farm where wine and extra-virgin olive oil are produced. The owners take us on a tour of the property, and together we’ll gather elderflowers (sambuco) to make elderflower syrup. We’ll have dinner here but first we’re treated to a live performance of bel canto, a traditional Italian vocal style renowned for its beauty. · ART IN URBINO AND A CULINARY JOURNEY THROUGH EMILIA-ROMAGNA Day Four (Wednesday): Today we’ll explore Urbino, where we begin to appreciate the power and splendor of Montefeltro’s palatial residence that today hosts the National Gallery of Marche. The museum displays works of art by Piero della Francesca, Tiziano, and Raffaello, who was born here in 1483. In the afternoon we’ll learn about the ‘fossa cheese’, visiting one of the pits dug out of the tufo/volcanic tuff where this highly-prized cheese is aged. 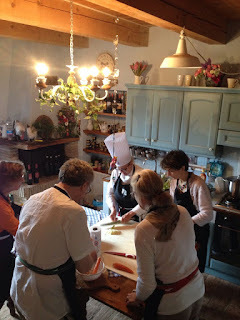 · AN ITALIAN PRANZO AND FELLINI'S RIMINI Day Five (Thursday): This morning we return to the Romagna hills for our second cooking lesson and the preparation of another delicious four-course lunch. We return to Santarcangelo, then get ready for a night on the town in Rimini. Here we’ll learn about Rimini’s Roman and Renaissance history, then shift to the twentieth century and follow the footsteps of Italian filmmaker Federico Fellini, who was born in Rimini in 1920. 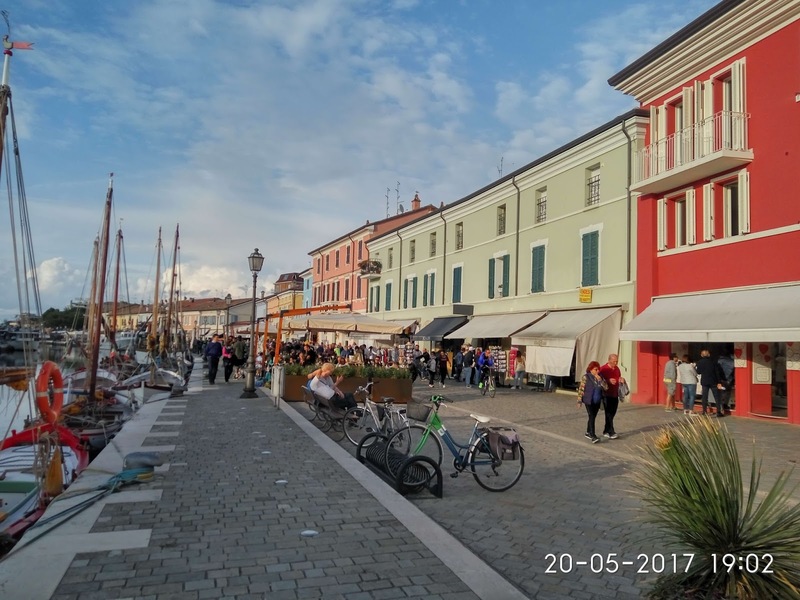 For dinner we’ll reach the seaside town of Cesenatico where we’ll have an unforgettable fish dinner by the sea. 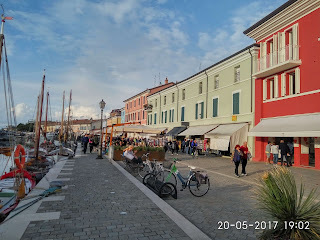 · MARKET DAY AND THE REAL ITALIAN PIZZA Day Six (Friday): Today is the weekly market in Santarcangelo and you’ll have time to explore it at your leisure. In the late morning we’ll meet up for a ‘cooking show’ demonstration by a professional pastry chef, followed, of course, by savoring his delicious creations. In the afternoon we’ll go to the very place where in 49 BC Julius Caesar crossed the Rubicon (river) with his troops. Afterwards we’ll walk to a pizzeria for today’s cooking lesson—making traditional Italian pizza under the guidance of a professional pizzaiolo (pizza chef). · AN UNFORGETTABLE TRIP BY FIAT 500 Day Seven (Saturday): To kick off the weekend we’ll attend a procession of the legendary Fiat 500 cars and take a ride to the medieval village of Longiano. Together we’ll visit a well-known frantoio (olive mill) to learn about and taste the local extra-virgin olive oil, and we’ll have lunch at the locanda (inn) next door. After some free time in Santarcangelo we’ll have our last outing, down to the enchanting village of Roncofreddo. Here we’ll have our final memorable dinner in a little Osteria. · 'ARRIVEDERCI' Day Eight (Sunday): After breakfast, departure by private transfer to Bologna airport or to Rimini train station. Our four-star hotel, described as ‘Italian sophistication in a medieval setting’, is a recently renovated villa surrounded by lovely grounds and just minutes away from the ‘old town’ historical center of Santarcangelo di Romagna. You’ll quickly become accustomed to meeting up at our favorite café in centro where the barista, as he does with all his clients, will soon learn your name and preferred beverage. Our lunches and dinners are at the best regional restaurants where your fellow diners are locals and where we’ll enjoy the excellent wines of the area. Most days require some walking, but no more than is usually required for, say, a city stroll or a guided tour. Transfers between activity locations vary, but usually are no more than 20-30 minutes in a van, with the exception of the first and last day transfers to/from Bologna (approximately one hour and fifteen minutes), and the day we visit Urbino, which requires an hour and a half each way. Price are per person and based on double occupancy and minimum 6 people on the tour. A limited number of single accommodations are available for a supplemental charge of 330 euros. Me (in center with food in mouth!) always eating! Everything was SO tasty! Bravo Chef! WRITE ME now to get more details or to book the trip! Please write "Romagna trip" and date you wish in the subject of your email.